Our good friends at Digitimes have picked up on new orders from Barnes & Noble. They're getting hints that Barnes & Noble are about to release a new ebook reader and that it's supposed to be announced soon. According to their sources the NC2 is going to be another 7" model with a number of details in common with the current NookColor. Taiwanese suppliers will ship key components to be used in Barnes & Noble's Nook Color 2, scheduled for release in September 2011, according to industry sources. TPK Holding will supply touch panels used in the e-bok reader, while Inventec will be responsible for the assembly, the sources said. 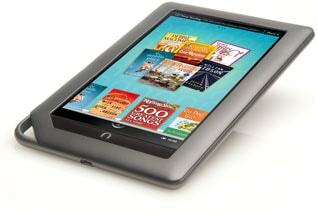 Pegatron is also said to have received orders for Nook Color 2. It is reported that Inventec and Pegatron would be able to supply two to three million units of Nook Color 2 by the end of 2011. This doesn't surprise me at all. I've been saying for a few weeks now that a new NookColor was coming soon. I expected it to ship in October, not September, but I had already guess it was coming. In fact, while it may be announced in September, I expect that it will ship in October. Since we know it will likely have a 7" screen and Wifi, what other improvements do you expect? I'd guess that it will have a faster and newer CPU, more Flash storage, and I would bet that it will be running a heavily modified version of Gingerbread (Android v2.3). This next part is less likely, but I think it could possibly have a camera on the back. That would be useful as a note taking tool, right? In the article it states “E Ink will continue to supply e-paper backplanes for Nook Color 2, according to the sources.” That doesn’t sound right. The NC doesn’t use e-paper. I know. But E-ink did develop and license the screen tech used in the NookColor, so that one mistake might be the result of the reporter’s goof, not bad data. Camera would be useful for scanning UPCs at B&N to see if a print edition is available in e to buy immediately (or to complain about the too-high price in real-time to a human being). Yes, I know. I’m working on my denial post right now. And the nook color wins on modifiability. With the nook color being sold for $250 or less, i really don’t see the fuss about the Amazon tab except maybe they bundle it with Amazon Prime subscription. Wouldn’t it be suprising if the NC2 turned out to be a B&N version of the HTC Flyer? HTCs pricing Al is a bit high but it is a step up from NC1 technology. Also, the “magic pen” would be a good fit for this type device.